When you trudge up to the Old Man of Storr, you’re always hopeful of good light to make the hike worthwhile. Imagine our joy while on my Skye workshop we got a sunrise like this! Can you spot the sheepish photobomber? 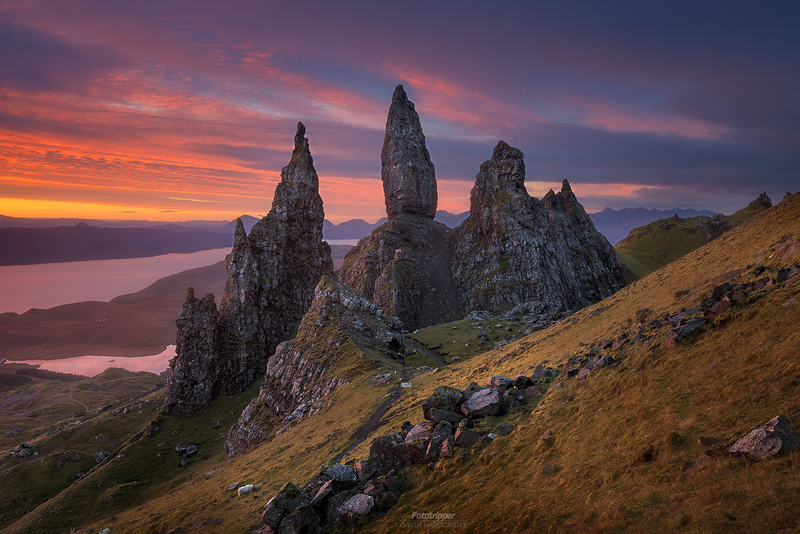 As a landscape photographer I often shoot with super wide angle lenses, but having worked this location many times before I’d learned that a longer focal length filled the frame with what was most interesting – in this case ‘The Old Man of Storr’. I used the Canon 24-105mm zoom lens on the Sony A7RII to zoom in to 40mm and isolate the rock structures which simplified the composition. During sunrise or sunset I pretty much never stop shooting. I like to have multiple exposures so that I can choose the perfect moment back home in the lab. The reason I chose this particular frame was because I just loved the coloured cloud formation directly above the topmost spire. It formed a looping gap just above the spire in such an interesting way that I couldn’t have asked for better conditions. Luckily the sheep that you can see on the slope kept pretty still while munching on that peaty grass so there was minimal movement during the 0.8″ exposure. If you’d like to join me for a week of shooting, including this very viewpoint please take a look at my Scotland Photography Workshop.